Bridewell’s Open Afternoon scheduled for this Sunday has been postponed until 15 July due to wet weather. According to Mary Elford “the field we use as a car park is already saturated and more rain is forecast. We’re trying to find ways of letting our potential visitors know about this”. To celebrate and mark the Queen’s Diamond Jubilee, whilst also raising money for Cancer Research UK, we will be holding a village “Bake Off”, making cakes fit for Queen (and Country)! So put on your aprons, get baking and help make “hundreds and thousands” for charity! 2) Right Royal Cupcakes (2 classes – under 12s and over 12s). Entry forms with further information are available from the village shop, or 5 Busby Close. Alternatively, please visit http://stonesfieldjubileebakeoff.wordpress.com for more information about the event and to download an entry form. The Queen’s Diamond Jubilee - Tuesday 5th June 2012 – 12noon to 4pm – The St. James’ Centre. Cake(s) to be delivered to the St. James’ Centre between 12noon and 1pm. Judging will take place between 1-3pm, with the winners of the baking categories and the raffle being announced from 3pm. Don’t fancy baking, just tasting? Then pop along to the St. James’ Centre between 12noon and 4pm for a Bank Holiday cuppa and a cupcake, take a look at the “Bake Off” entries, and enter the raffle – you could win some cake (and other great prizes) to take away! There will also be a bookstall selling second-hand books. All proceeds from cake entries, cuppas, cupcakes, raffle and book sales to Cancer Research UK. 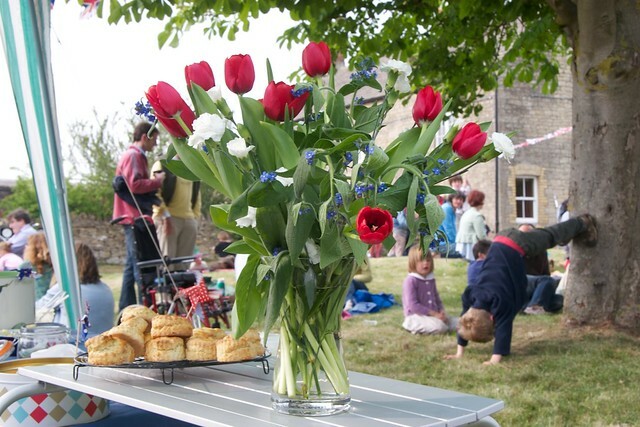 Stonesfield had its own street party to celebrate thew Royal Wedding - in relaxed style as a picnic on the common outside The White Horse.